A car funded by a Nebraska donor will help thousands of people in need in the city of Akko. The city of Akko celebrated this week as it welcomed a new van that will help thousands of people. 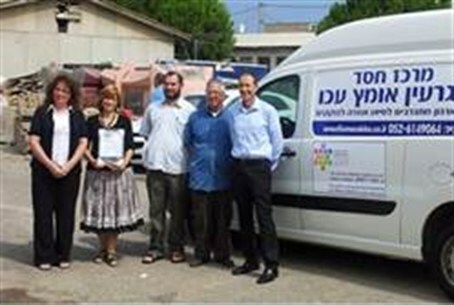 The van will serve the Merkaz Hachessed (The Kindness Center) operated by the city’s Garin Torani (Torah nucleus group). The Garin, a group of religious-Zionist families, works with residents of the city to operate the Kindness Center. The Center distributes 350 food packages each week to those who are elderly, ill, handicapped, or otherwise in need. In addition, the Center distributes more than 750 sandwiches to schools each day. The sandwiches are given to children whose families struggle to afford food. When holidays approach, the Center kicks into high gear, distributing more than 900 food packages. The new vehicle was donated by Henry Davis of Omaha, Nebraska, with help from the Jewish Agency’s project for the Western Galilee region. “The new car will help volunteers at the center every day… The donation of this vehicle is very important for the work of the Center, which is operated entirely by volunteers, and we would like to thank the generous donor and the Western Galilee Fund from the bottom of our heart,” said Yishai Rubin of the Garin Torani.